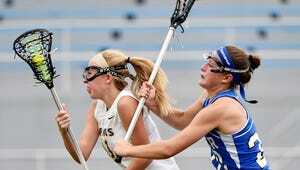 The Kennard-Dale Rams became the first YAIAA girls' lacrosse team to win a District 3 championship. HERSHEY - Kelly Wetzel gripped the ever-elusive district championship trophy and held on to it tight. After trying to win it for nearly a decade and after too many near-misses, the Kennard-Dale girls' lacrosse coach wasn't going to let it out of his sight now that the Rams had finally triumphed. With a 12-8 win over Exeter Township at Hersheypark Stadium on Thursday, the Rams elevated themselves from district afterthought to district champion, and they secured a spot in the history books as the first YAIAA lacrosse team to win district gold. "It's a great feeling," Wetzel said with a smile. "I've waited nine years for this. It's awesome. I wish we would've played better at the end, but we'll take it." Behind stellar performances from its sophomore trio — Morgan Bowings (five goals), Maddie Day (three goals) and Clare Boone (12 saves) — Kennard-Dale seized an eight-goal lead at one point in the second half. But that's when Exeter Township started to make a run. "We beat them by nine earlier this season, and I think that was in the back of their mind that they might come in and beat them easily," Wetzel admitted. "We had to to tell them that's not the case. You have to throw that game out the window and play a new game." The Eagles went on a 4-0 run to cut the lead to four with less than five minutes left, but that's as close as they would get because Boone wasn't flustered in net. The sophomore has been among the YAIAA's best goalies all season, and she proved it once again Thursday, stopping 12 shots, including three key stops in the final two minutes. "The lead helped with my confidence and we just wanted it so bad," Boone said. "We came this far, we couldn't lose it at the end." Boone's saves helped seal a 12-8 win, and the celebration was on. A contingent of Kennard-Dale fans who made the trek from Fawn Grove cheered louder than they had all evening as the Rams were awarded the district trophy. "It was awesome, I don't even have words for it," Bowings said of hoisting the trophy. "I'm so happy right now." The Rams had come close before, including four district semifinal appearances and a loss in the 2013 district title game to Manheim Township, which had won every championship before this season. "It feels so good, finally," Day said. "I feel like we really deserved it this year." Day's older sister, Morgan, set the national record for career goals scored during a stellar four years at Kennard-Dale, but never won the district title. So when asked if she would gloat to her sister with her gold medal, Maddie Day smiled and paused. "No. ... Well maybe a little."